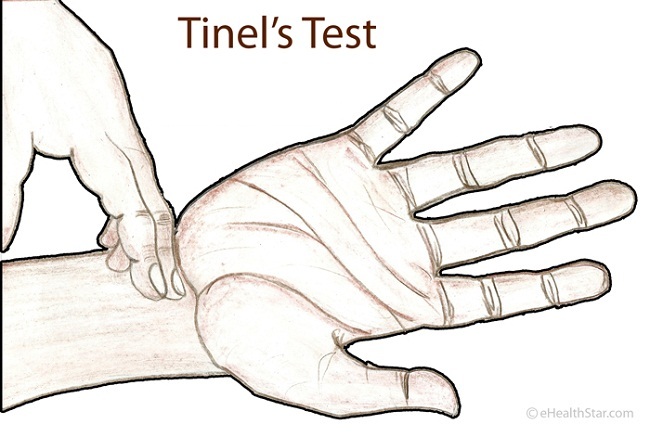 Tinel’s test is a provocative test in which tapping over the damaged nerve triggers tingling or electric shock-like sensation (paresthesia) distally from the tapping site. How is Tinel’s test performed? followed by harder tapping at the typical sites for the particular nerve. NOTE: Excessively hard tapping may trigger symptoms even in a healthy nerve. What does positive Tinel’s sign mean? Tinel’s sign is positive when tapping over the nerve results in paresthesia (tingling, pins and needles, electric-shock sensations) in the distribution of the nerve distally from the point of tapping 5. Tingling is a sign of nerve regeneration (recovery) after a nerve injury or compression 1. When is the sign negative? When only the myelin sheath of the nerve is damaged (demyelination), but the nerve axon remains intact (this is called a first-degree nerve injury or neurapraxia). Video 1. A demonstration of the Tinel’s test for the brachial plexus. (between the shoulder and the neck) suggests a damage of the brachial plexus. the ulnar, median and radial nerve in the elbow, forearm and wrist. Tapping over the ulnar nerve in the cubital tunnel in the elbow can produce symptoms typical for cubital tunnel syndrome (pain and tingling in the forearm, ulnar-palmar side of the wrist and hand and in pinky and ring finger). Tapping over the ulnar nerve in the ulnar-palmar side of the wrist can produce symptoms of Guyon’s canal syndrome (tingling in the 5th and 4th finger). Tapping over the median nerve at the center of the palmar side of the wrist can produce symptoms of carpal tunnel syndrome (tingling in the thumb, index, middle and ring finger). Tapping over the radial nerve at the radial-back side of the wrist can produce symptoms distally from the tapping (radial-back side of the hand). Video 3. A demonstration of the Tinel’s test for the peroneal nerve. suggests a damage of the peroneal nerve. Video 4. A demonstration of the Tinel’s test for the posterior tibial nerve. suggests tarsal tunnel syndrome 3,6. In a third-degree nerve injury. In a sixth-degree nerve injury (a combination of various nerve injuries). In individuals with a nerve tumor (neuroma), tapping over the neuroma triggers strong pain, and tapping within few inches proximally of the neuroma (toward the body) triggers a weak pain 2. For example, pain during tapping over the front side of the foot between the 3rd and 4th toe suggests Morton’s neuroma. Behind and below the lateral ankle, over the sural nerve (short saphenous nerve). Specificity of the Tinel’s sign in carpal tunnel syndrome is 70-90% (only this percent of individuals who have positive Tinel’s sign actually has carpal tunnel syndrome). Tinel’s sign has got the name after Jules Tinel (1879-1952), a French neurologist 4. When using the tinsel test, I have a sensation that seems to travel. Using tinsel test the at knee. The sensation starts at knee crossing over the ankle moving to big toe. I have foot drop but EMG shows neurpraxia post traumatic trip down stairs, 8 months ago. I believe, you would need to ask a neurologist for an explanation. How common is there a negative Tinel test with tarsal tunnel or Baxter’s nerve entrapment? Symptoms and EMG/NSC point that direction but negative Tinel sign. Dr. is recommending tarsal tunnel release. Is it possible the entrapment is elsewhere in that area so not responsive to Tinel test? A neurologist can answer this much more reliably than I can. Does a positive Tinel’s over the sural nerve rule out the back as the source of heel pain? In radiculopathy, direct palpation or percussion over the exiting nerve root may provoke the patient’s familiar limb or axial pain; if the tenderness or a Tinel’s sign is elicited more laterally, such as in the supraclavicular fossa, then the diagnosis should be questioned. To be exact, positive Tinel at the heel does not automatically “rule out” a pinched nerve in the back, because this could co-exist with a sural nerve damage. But a pinched nerve in the back alone would not make Tinel’s test in the calf positive. I have occipital neuralgia and the doctor told me that my tinel’s sign is positive, what is the best way to treat this? Kaitlyn, it would be good to know what causes the neuralgia – it could be a spinal-cord related issue, but a doctor can tell. how long does it usually take for a compressed nerve to return to normal. I have food drop due to compartment syndrome. I feel an electric shock in feet when i tap the nerve where compartment syndrome happened (muscle below knee). is this a healing sign? vipin, electric shock may or may not be a healing sign. If the underlying cause was removed, the nerve is probably healing. The doctor who treated you may know better about the heeling time: probably weeks or, to complete normal, probably months. Chantelle, tingling and burning suggests the nerve involvement. This could possibly happen due to development of internal scars (adhesions). I suggest you to contact the surgeon who operated you. If a patient has a positive tinel’s sign that extends all the way to the distal end of a limb does it mean that the nerve is intact? For example, percussion over the fibular head elicits a tingling in the dorsum of foot in the face of a foot drop. lance, the signal can travel along the damaged nerve, except when the nerve is cut. Tinel’s test may be negative in demyelinating diseases in which only the myelin sheath of the nerve is affected, for example in multiple sclerosis. Can there be a positive tinel’s sign few months after the excision of radial nerve schwannoma of arm.. It could be possible; it could be also from the schwannoma regrowth or some surgery complication, so if in doubt, please contact your doctor. Dr. Sollender, I have the link you provided as the 1st reference and, yes, that page mentions only tingling and that “true Tinel’s sign is never painful”. © 2019 (eHealthStar). All rights reserved. Reproduction in whole or in part without permission is prohibited. Ehealthstar.com should not be considered medical advice. Creative Commons and free image use.